This weekend it is worth fighting the parking and traffic of the first days of the St. Paul Winter Carnival to hear Pete Whitman’s X-Tet at the Artists Quarter. The X-Tet naturally is a group of ten musicians and they don’t even fit on the AQ stage. Technically a small big band, Pete has been directing this accessibly modern ensemble for much of the decade, and he’s assembled quite a cast of performers—“the Daves” (Milne, Karr, Hagedorn), an unbeatable rhythm section (Laura Caviani, Gordy Johnson, Phil Hey), and Adam Rossmiller, Kelly Rossum, Jeff Rinear, and of course Pete himself. Big sounds tonight and Saturday at 9 pm. 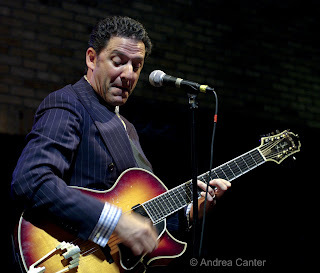 John Pizzarelli’s back in town. That one-night stand in August wasn’t enough, so now the guitarist/vocalist is back with an outstanding quartet (including brother Martin on bass) for two nights. John’s chops make guitar-wielding dad Bucky proud, and his easy swinging voice fits a small cabaret as effectively as a large concert stage. We get the best compromise hearing him at the Dakota Jazz Club, January 25-26. And the Dakota can keep you warm all weekend with the return visit of Estaire Godinez, LA-based percussionist/vocalist. She always draws a crowd and a hot band. Katie Gearty sings with The Wolverines Trio every Sunday this month for the Times’ Jazz Brunch. Katie has a versatile voice that shines on jazz standards, R&B and blues. A perfect partner to Eggs Benedict and frittata. Stop back for a drink or late dinner on Wednesday nights in January when Maud Hixson is singing with the Wolverines. More songful entertainment awaits at the Dakota on Tuesday night with Connie Evingson, and again on Wednesday night with Charmin Michelle—she must be taking a night off from Fireside Pizza! Need your free jazz fix? Check out the southwest Minneapolis oasis of spontaneous improvisation, electronica and other odd-ball activities that keep the local jazz scene fresh and unpredictable—Café Maude. Saturday night (January 24) you’ll find sax specialist Chris Thomson testing the limits of his saxophones and bass clarinet with the effects of loop pedal and laptop in partnership with percussionist Tim Glenn in what is billed as a “free electronic duo.” And the music is free, too. Midweek warmup with a Brazilian twist is set for January 29th when guitarist/vocalist Robert Everest brings his band to the Dakota, featuring pianist extraordinaire Mary Louise Knutson. Things are always hot midweek at the AQ--with the Tuesday Night Band. 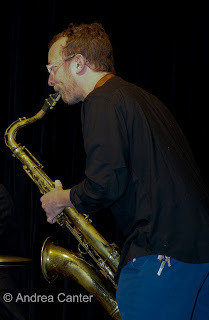 And fun and jazz go well together Wednesday night thanks to the Dave Karr Quartet. Next weekend—mark your calendar for the Artist Quarter’s two-night festival of “Guitar Heroes” with three each night, Dean Magraw, Sam Miltich and Billy Franze (Friday) and Dean Granros, Chris Olson and Cory Wong (Saturday). Six guys, six strings, six degrees of separation. Photos: (Top) Chris Thomson, unplugged last winter at MacPhail; John Pizzarelli at the Dakota last summer. Photos by Andrea Canter.